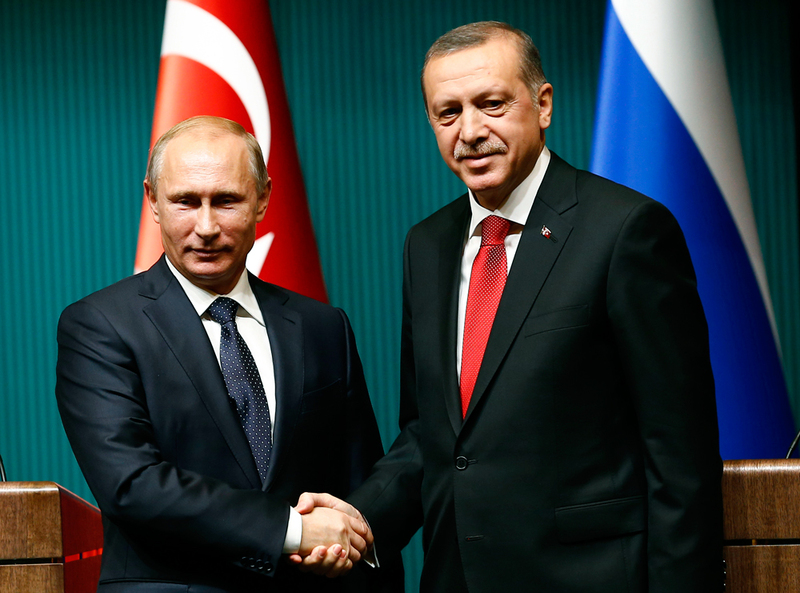 Russian President Vladimir Putin shakes hands with Turkey's President Tayyip Erdogan after a news conference at the Presidential Palace in Ankara December 1, 2014. The Presidents of Russia and Turkey, Vladimir Putin and Recep Tayyip Erdogan, will hold talks in St. Petersburg on August 9, Russian presidential press secretary Dmitry Peskov told reporters on July 26. "Indeed, the timeframe of the Turkish president’s visit has been agreed - the visit will take place on August 9, the meeting (between Putin and Erdogan) will be held in St. Petersburg, as we expect," the Kremlin official said. According to him, St. Petersburg was proposed as an option for the talks and "the Turkish side agreed." Peskov said that the talks’ agenda is currently being worked out. "There is the exchange of various proposals, but, certainly we have something to talk about," the Kremlin representative said, adding that it will be the first meeting between Putin and Erdogan since the "collapse" of the bilateral relations last November and the start of their improvement in June. "It can be said with confidence that there will be no shortage of topics for discussion," the Russian presidential press secretary said. On June 29, Russian President Vladimir Putin held a telephone conversation with Turkish President Recep Tayyip Erdogan. Putin’s call was made in response to Erdogan’s message in which he apologized for the Sukhoi Su-24 bomber the Turkish Air Force jets downed over Syria in November 2015 and said he wanted to mend the situation. The message from the Turkish president was sent to the Kremlin seven months after the Su-24 tragedy. By apologizing for the incident, Ankara fulfilled Moscow’s condition for restoring the long-term partnership between the two countries. It was also noted in the letter that a legal case has been opened against a Turkish citizen suspected of involvement in the death of the downed plane’s pilot, which was another precondition for the normalization of relations. Putin subsequently lifted the ban on charter flights to Turkey and instructed the government to negotiate a revival of trade with Ankara. The conversation of the two presidents on June 29 was the first direct contact of the leaders since November 2015.